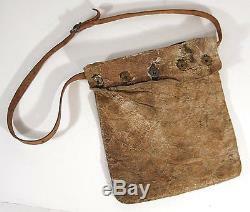 Very rare and wonderful, ca1890's Native American Plains Indian Buffalo Hide Bag. This outstanding 19th century, hand made buffalo hide Bag measures approx. 10" long and 8 1/2" wide. It is hand thread sewn and features 19th century brass buttons and a late 19th century commercial leather strap which is attached with hand pounded copper rivets. The buttonholes are sewn at the top and bottom edges by hand in order to prevent the hid from tearing at the holes. It is difficult to date a hand made Bag like this but it is definitely 19th century - the strap is ca1890's but it appears that it may have been a later addition as there a matching brass button on the back of the bag and thread attesting to the fact that there was another button on this side also - these buttons may have been used to attach the bag to a belt or other piece of clothing. We have always admired these types of items and took the plunge into an area where we had not ventured often before. The Buffalo Hide Bag offered here is unconditionally guaranteed original and of the period. They are NOT reproductions or modern recreations but an original, hand crafted, 19th century Buffalo Hide Bag. The Bag come with our no questions asked return privilege and our lifetime guarantee of authenticity. They are guaranteed to be deemed authentic, original and as described by any qualified third party authentication service. This very rare and wonderful, 19th century Buffalo Hide Bag is in very good condition showing age appropriate, honest wear. All of the hide elements intact and the hide is supple with cracking to the surfaces. There is a small and very old had sewn repair to a hole in the hide on the back side of the Bag and there is some wear around the buttonholes but no breaks. The commercial leather strap is intact, sound and strongly attached at the rivets. All elements of the Bag are original although the strap may have been a later addition as mentioned above. This Bag came to us from a Midwestern Collection. A very rare and wonderful, Native American Plains Indian Buffalo Hide Bag and a fantastic addition to any collection!! The item "Ca1890s NATIVE AMERICAN PLAINS INDIAN AMERICAN BUFFALO BISON HIDE BAG" is in sale since Friday, April 22, 2016. This item is in the category "Antiques\Ethnographic\Native American". The seller is "walnutts" and is located in Brewster, Massachusetts. This item can be shipped worldwide.